I love Indian Butter Chicken. When I lived in Virginia, it became a comfort food, especially on cold nights. However, now that I have to eat gluten and dairy free, I have to cook a different version at home versus going out to eat it. Traditionally, this recipe is made with yogurt and a bunch of other ingredients that my body can no longer tolerate. 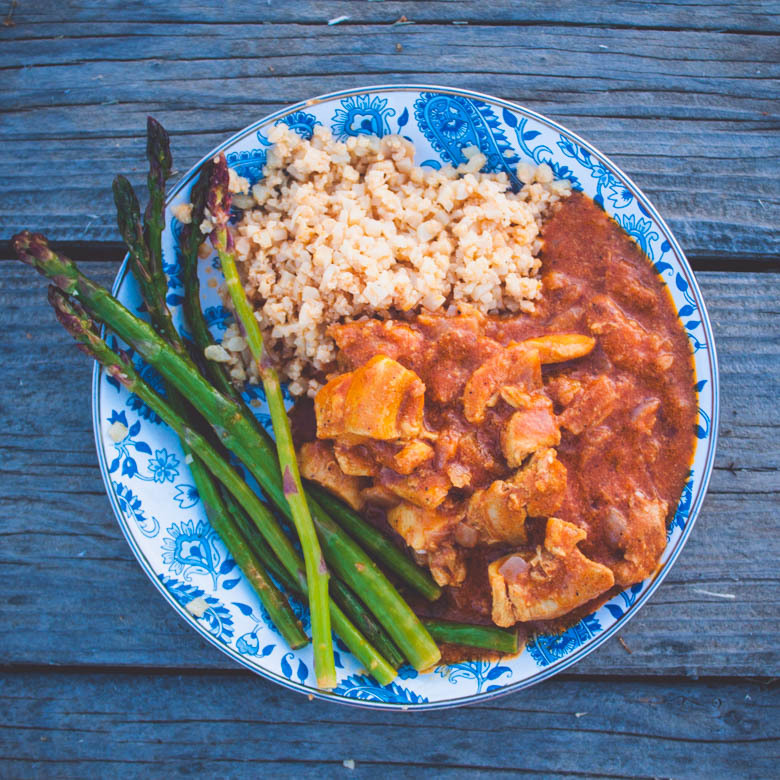 With a few substitutions, this Gluten and Dairy Free Indian Chicken Recipe allows me to have my comfort food and not get sick! I hope you enjoy it as much as I do! Mix all marinade ingredients other than chicken in bowl. Add chicken. Set aside in refrigerator. Heat pan on medium heat. Add ghee or coconut oil. Once melted, add onions and cook until a very dark golden brown. Don’t burn them but they will be dark. It should take 15-20 minutes. Add ginger and garlic and sauté for another 3-4 minutes. Add all curry spices to pan, allowing them to bloom. Turn the marinated chicken in the bowl again to cover as thoroughly as possible and add chicken to pan. Quickly stir-fry to coat chicken with the masala in the pan. Add green pepper and tomato sauce. Cover the pan and simmer for 12-15 minutes. Add 1 can of coconut milk and the fenugreek. Allow to simmer for another few minutes. Serve over cauliflower rice (AIP & paleo), white rice, or paleo naan.